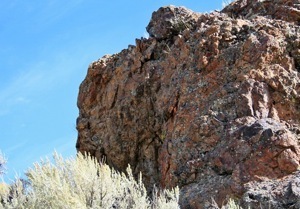 Slickenside on a jasperoid boulder shed from a large outcrop in Idaho’s White Knob Mountains. Slickensides are polished, striated rock surfaces caused by one rock mass moving across another on a fault. Jasperoids in this area are formed by varying degrees of replacement of limestone. Sorry about the grass shadows over the slickenside. I should have cropped that grass even closer than the cows had already done before taking the photo. 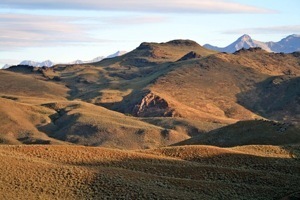 This area, on the border between National Forest- and BLM-administered lands is grazed, through a land-lease system. 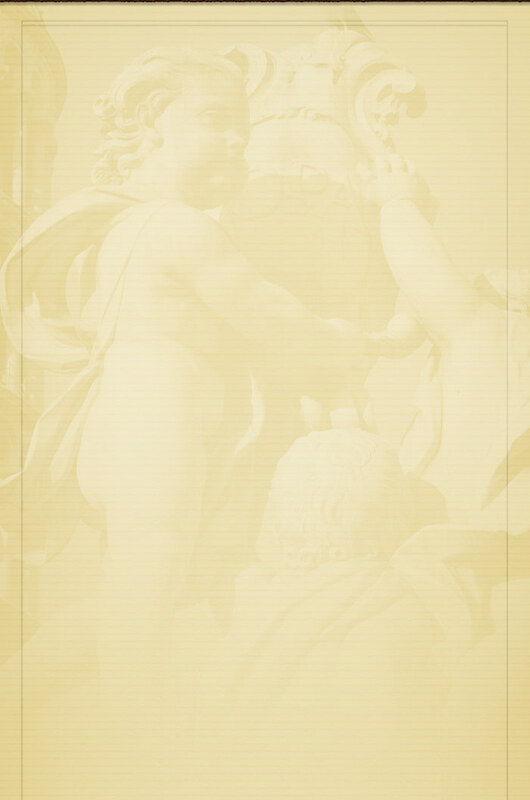 From Wikipedia: Jasperoid is a rare, peculiar type of metasomatic alteration and occurs in two main forms; sulfidic jasperoids and hematitic jasperoids. True jasperoids are different from jaspillite, which is a form of metamorphosed chemical sedimentary rock, and from jasper which is a chemical sediment. Sulfidic jasperoids are typical examples of silica-sulfide metasomatism of dolostones, and are found in Nevada and Iran. There are three major mining districts, Alder Creek, Copper Basin and Lava Creek, and numerous other prospects in the Mackay area. Most of the deposits were discovered during the 1880s when rich silver-lead ores were mined throughout central Idaho. Most production of the late 1800s and early 1900s was from oxidized silver-lead ore. The Empire Mine in the Alder Creek district, active intermittently from 1901 into the 1960s, was a major copper producer. 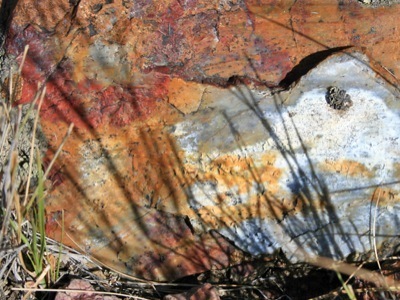 Many other properties in the area have been active intermittently since their discovery, but did not produce substantial amounts of ore. Three types of mineral deposits have been exploited in the Mackay area: skarn deposits, polymetallic veins in Paleozoic sedimentary rocks, and polymetallic veins in volcanic rocks. The skarn deposits are mainly in the White Knob Mountains where Tertiary leucogranite intrudes Paleozoic limestone...The deposits consist of chalcopyrite, pyrite, pyrrhotite, calcite, quartz, magnetite, flourite, scheelite, molybdenite, sphalerite, and specularite in addition to skarn silicate minerals (Umpleby, 1917). 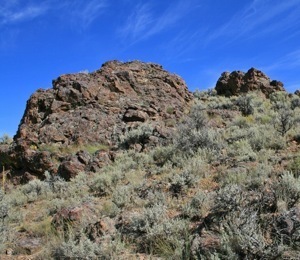 Pictured above: one of many jasperoid outcrops near the Prudent Man mining claim. The image on the right is a close-up of the jasperoid outcrop near the entrance to Bedy Canyon. All photos @Lynna Howard. Pictured above, and on the right, are overviews of the landscape in which the jasperoids can be found. 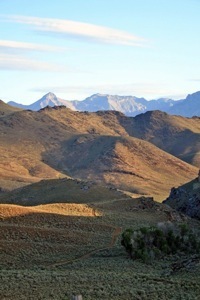 The peaks in the far background are part of the Lost River Range. In the photo on the right, you can see the road leading into Bedy Canyon. All photos @Lynna Howard. 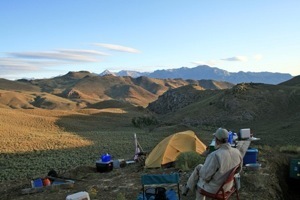 Photo on the left: Steve Howard, eating breakfast as dawn breaks. Lynna’s tent, wash stand, and the “kitchen” are also in the frame. Plume agate from the PrueHeart Lode has been carved into some interesting art pieces. See the link below. For tips on camping in the dry, primitive conditions here, I’m not sure you should consult me. How many decades can one spend camping and still depart with the tailgate on the truck down? Apparently, there is no upper limit. I loaded my truck and used 4WD to negotiate the steep hill leading out of the Prudent Man site. All my gear slid out the back, bouncing as it went. Luckily, I noticed fairly quickly and went back to find Steve laughing in the middle of the mess.